Van de Velde III was a Dutch still-life painter whose biography is difficult to reconstruct due to the scant surviving information on his life. Son of a printmaker named Jan van de Velde, he was born in Haarlem. His date of birth is not known but must have been in 1619 or 1620 according to various documents. 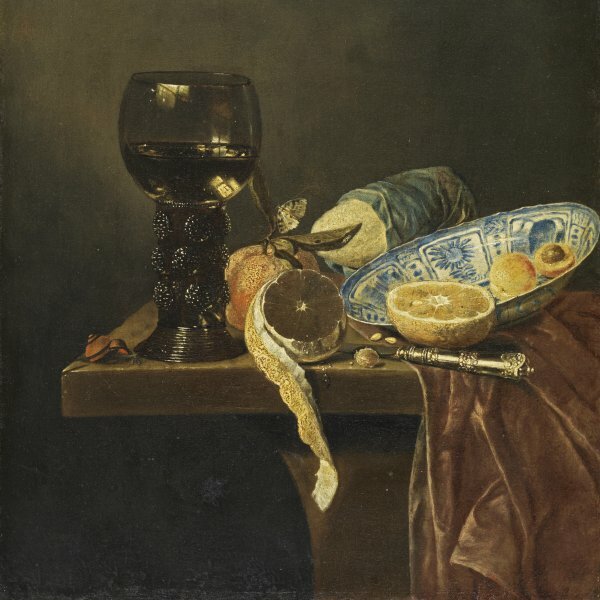 His first still life dates from 1646 but little is known regarding his training. In 1642 he is documented in Amsterdam where he married, lived and worked. Van de Velde III died in Amsterdam or Enkhuizen at some point after 1663, the date of his last known work. Van de Velde’s still lifes are generally simple compositions with a glass of wine, another of beer, smoking implements and on occasions a deck of cards placed at the corner of a tabletop. His most important contribution to the genre was the sensitivity with which he depicted a few, humble objects and he is thus considered one of the leading figures of the domestic, small-scale still life. Despite his limited repertoire of motifs, Van de Velde’s works exhibit considerable variety and he arranged and combined the elements in numerous different ways in order to avoid repetition. The objects depicted are visually related to each other and the artist made use of the spaces between them. Some depict a single glass of beer as the principal object, deploying a sophisticated use of the pictorial space. Van de Velde’s work reveals the influence of Pieter Claesz.’s simpler compositions, as well as that artist’s preference for smoking implements, particularly large, white Gouda pipes, spills and dishes with small embers. His palette is, however, much warmer and brighter, probably influenced by his contemporary, the great still-life painter Willem Kalf.